Villa's Alessandro Bianchi was one of the first to believe in the Franciacorta region's potential for making great sparkling wines, and the estate continues to be a leader, both in terms of the quality of the wines, and in terms of promotion -- one of the major problems besetting sparkling wines in Italy is the perception that they are either suited to toasts, if dry, or to desserts, if sweeter. You will also encounter them as aperitifs, but are much less likely to be served one between the beginning and the end of the meal. A pity, because a good sparkling wine can work wonders with all sorts of dishes, from risotti and pasta dishes through fish and meats, and to draw attention to this fact the Bianchi family has organized several editions of a program called Sparkling Menu, in which they ask chefs of top restaurants throughout Italy (and beyond) to build menus around one of their Franciacorta wines; the participants at the dinners rate the recipes (and the wine-food pairings), and the chefs who did the top-rated recipes in the various categories (antipasti, firsts, seconds and so on) are invited to Monticelli Brusati for a final dinner, at the end of which the most successful dish and pairing receive an award. It's an excellent idea others should pick up on, and a few years ago I was enthralled by a delicately roasted bird prepared by one of the chefs for the finale -- a pigeon perhaps -- that was superb with bubbly. Wouldn't have thought it, but it was. This year Roberta and Paolo (Alessandro's daughter and son-in-law) presented a couple of new wines, one of which would have gone perfectly with the above mentioned pigeon. 100% Chardonnay, 30 months on the lees. Pale brassy gold with brilliant brassy reflections and fine steady perlage. The bouquet is rich, with mineral accents supported by sour lemon and some delicate breadcrumbs. Quite welcoming. On the palate it's smooth and rich, with fairly intense lemony fruit supported by acidity and peppery accents from the sparkle, and by sea salt that flows into a fairly long soft savory finish. 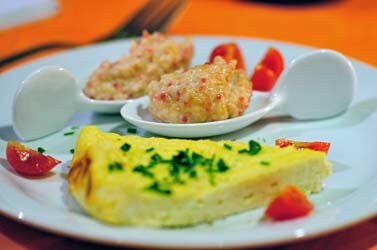 Quite pleasant and very approachable; it will work well as an aperitif or with simple fish or white meats, and also with vegetable based risotti. It's a little too soft for fattier risotti along the lines of cheese & truffles. This is 85% Chardonnay, 5 % Pinot Bianco and 10% Pinot Nero; it spends 30 months on the lees. It's pale brassy yellow with fine steady perlage. The bouquet is pleasant, with elegant lemony citrus fruit supported by minerality and some breadcrumbs, and by slight gunflint as well. On the palate it's fairly rich, with the sparkle conferring a pleasant peppery fullness, while the wine is fairly rich, with savory sour lemon fruit supported by mineral accents that flow into a clean fresh savory finish. Quite pleasant in an approachable key -- it's a brut but is not tremendously acidic -- and will drink quite nicely as an aperitif, and will also be a nice wine to drink with a meal built around cheese (say an elegant cheesy risotto), fish, or white meats. A new entry, this is 90% Chardonnay and 10% Pinot Nero; some of the base wine spends 3 months in wood, and then it spends 48 months on the lees. The name, Extra Blu, is a reference to the marine origins of the sediments in the vineyard, and in terms of positioning it's mid-way between the Brut and the Pas Dosé. It's pale brassy yellow with fine intense perlage, and has an elegant bouquet with bread crumbs and gunflint supporting savory minerality and some sea salt; there's also slight sour lemon fruit that provides depth. On the palate it's ample, and dry, with bright minerality and gunflint that gains support and airiness from the sparkle, and flows into a clean fresh gunflint laced finish with underlying minerality and sparkle, which continues at length. Quite pleasant, and though one could happily drink it as an aperitif, it will also drink nicely with foods, ranging from elegant first course dishes (white fish-based risotto comes to mind), cheese dishes, and also fish or white meats. It's versatile, and very pleasant to drink. 85% Chardonnay 15% Pinot Nero. Some of the base wine ages in wood for 6 months, and then it spends 48 months on the lees. Pale brassy gold with brilliant brassy reflections, greenish highlights, and fine persistent perlage. The bouquet is elegant, with gunflint and minerality supported by wet bread crumbs and slight hints of butterscotch and sea salt; it's quite harmonious and pleasant to sniff in a bracing sort of way. On the palate it's full, with some of the fullness coming from the sparkle, and quite bracing, with powerful minerality and mineral acidity that flow into a clean mineral finish. It has zing, of the sort I look for in a quality sparkling wine. It's not as approachable as some of the other wines -- rather it demands one's attention -- but it has a great deal to say, and the cooler wetter weather of the 2005 summer only helps matters by increasing acidity and minerality. It's one of those wines one hates to pour out at a tasting. 85% Chardonnay and 15% Pinot Noir; some spends time in oak, and then it spends 42 months on the lees. Brassy gold with brilliant greenish gold reflections. The bouquet is powerful and rich, with sour lemony fruit supported by considerable gunflint and savory accents, with underlying wet bread crumbs. By comparison with the Pas Dosé it's a little more harmonious, and also has slightly more gunflint. On the palate it's ample, rich, and creamy, with fairly intense bitter gunflint supported by creamy sparkle and bitter mineral acidity that flows into a clean warm rather mineral finish. Very pleasant, with considerable character and harmony, and also extremely approachable; the Pas Dosé is a bit more demanding, whereas this is more welcoming. It's a question of degrees, and which you will prefer will depend upon your taste. 80 Chardonnay and 20% Pinot Nero, the base then spends 6 months in wood and 60 months on the lees. It's pale brassy gold with greenish highlights and brassy reflections, while the perlage is very fine and persistent. The bouquet is elegant, with savory mineral accents laced with sour lemon acidity and slight wet bread crumbs; great harmony and finesse., and quite pleasant to swish and sniff. On the palate it's, well, the word "good" comes to mind; by comparison with the 2005 wines it's a little less acidic, but displays beautiful gunflint minerality and savory notes supported by creamy sparkle and some bitter accents that flow into a clean fresh finish with underlying savory lemon and gunflint bitterness. Quite deft, and very elegant; it will drink nicely as an aperitif and it will be perfect for roasting or drinking with friends far from the table, or, if you want to be extravagant, you could drink it with crustaceans or even oysters. Note -- this was the last wine of the second day at Vinitaly. They have increased the pinot noir to above 40% and the wine spends 30 months on the lees. Pretty onionskin with brilliant brassy reflections and fine steady perlage. The bouquet is deft, with minerality and slight hints of forest berry fruit supported by gunflint, breadcrumbs, and savory accents. On the palate it's full, with the fullness coming from both sparkle and minerality, and quite refreshing, with bright minerality and acidity that flow into a clean dry finish. Very pleasant, and will drink nicely as an aperitif or with foods, and in terms of pairings I might think of delicate white meats, while a fellow taster liked it with spicy foods. The first wine of the day, and it's an auspicious beginning. This isn't a vintage wine, because the Disciplinare says no vintages should be applied to sweeter bubbly, a policy one can agree with or not, but that must be followed. The wine is all 2007 however. Pale onionskin with fine insistent perlage. The bouquet is bright and rich, with sweetness mingled with some raspberry fruit and slight savory notes that add depth and freshness. Inviting. On the palate it's full and rich with dusky raspberry fruit supported by minerality and acidity, while the sparkle also confers fullness, and it flows into a clean bright fairly mineral finish. Quite pleasant, and is a wine that will work well with piquant cheeses, or with wild berry fruit and other fresh desserts. It's also a wine one could open on a summer evening while watching the stars come out. Brassy yellow with brilliant brassy reflections and white rim. The bouquet is deft, with elegant minerality and hints of butterscotch supported by some gunflint and underlying white fruit, which is towards apple. On the palate it's graceful, and quite mineral, with minerality and mineral acidity that are quite harmonious, and flow into a clean mineral finish. Pleasant, in a delicate key, and will drink nicely with fish, and also be a nice aperitif. This is the last vintage of Curtefranca Rosso -- they will be shifting to Sabino IGT because changes to the Disciplinare will further limit the amount of Barbera and Nebbiolo the wine can contain, something they don't want to do because on their lands Barbera and Nebbiolo grow well. The bouquet is bright, with rich red berry fruit supported by lively berry fruit acidity and some underbrush. Quite fresh. On the palate it's light, with lively slightly sour cherry fruit supported by tannins that have slight brambly accents and flow into a clean berry fruit finish with deft savory tannic underpinning. 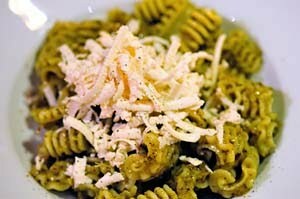 Quite pleasant, and quite versatile, from red sauced pasta dishes through simple grilled meats and light stews. You will want a second bottle. Deep cherry ruby with lively cherry rim. The bouquet is rich, with elegant slightly jammy cherry fruit supported by brambly greenish accents and some vegetal notes. Nice depth and balance, and very fresh. On the palate it's medium bodied and quite elegant, with rich red berry fruit, sour cherries in particular, though there are also black currants and hints of blueberry, supported by lively berry fruit acidity supported by very smooth sweet tannins; it's quite graceful and very young. One could drink it now with a steak and be very happy, or -- if one has a case -- keep it for 5-6 years, and then open a bottle a year for a number of years. Deep ruby with violet in the rim. The bouquet is unmistakably Merlot, with rich cassis supported by some graphite shavings and hints of underbrush, and also some alcohol. On the palate it's deft, and very smooth, with moderately intense cassis fruit supported by tannins so smooth they seem smaller than they are, and by deft mineral acidity that flows into a fairly long deft finish with some graphite shavings and deft fruit that continues at length. Quite pleasant but one-track; it's a Merlot and with respect to the Gradoni lacks the complexity that the other varietals confer. If you like Merlot you will like it very much, but if you are less of a devotee you may find more satisfaction with the Gradoni. For more information on Villa (they have a beautiful agriturismo too) see their site. 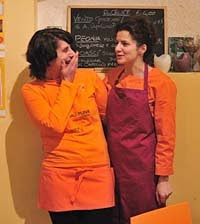 It isn't at all easy to open a restaurant in the hyper-protected heart of Monterotondo, a small town in the hills not far from the Via Salaria, about 20 km from Rome. Maria Luisa Conrado knows this well; the bureaucracy, which makes things difficult under the best of circumstances, given a setting like this becomes the major obstacle to the realization of a dream. Not too long ago, in 2008, she took over a wine bar with the goal of transforming it into a real restaurant. The change came January 16 2010, with the birth of the Rocca del Gusto: the place has 6-7 tables in a single hall with inviting niches in the walls, and an arched ceiling, evidence of the building's original function. The color apricot predominates, and the furnishings are simple, but provide a warm, relaxed atmosphere. Maria Luisa, self-taught and driven by passion and the desire (realized, I would say), to have a place that isn't based on aesthetics, though they do play their part, nor extreme transformations of the raw materials, but rather absolute quality. As Maria Luisa says, "a different kind of food, one not standardized, not mass-produced, not what everyone already knows." Hence her constant search for niche products, when possible with no carbon footprint, preferably organic, privileging direct relationships with producers, and thus the steady search throughout the area, drawing also from those who have already considerable experience in these matters, for example Slowfood's Presidia. "To make people talk about what the land provides" is, in a nutshell, her philosophy. 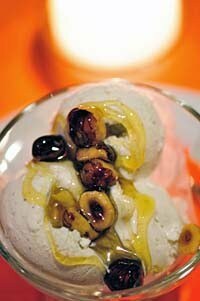 To not give space to chefly narcissistic impulses, but make the ingredients the true protagonists of the dishes. It doesn't take much, one might think, and one would be wrong. Every ingredient does undergo some sort of preparation, either being cooked or simply being placed next to other ingredients or sauces. Nothing is taken for granted, one need only make a mistake pairing, or in the proportions, or cooking time, and the dish is no longer what it must be to be appreciated. All elements Maria Luisa has mastered, as I have found in my many "visits," which are in part due to my good fortune of living nearby. In the kitchen she uses organic eggs, flour, honey, chocolate, and extravirgin olive oil as the starting point for a variety of dishes, which change monthly. There is no want for surprises, including the Monterotondo Ricotta Pie with tarama sauce (made with bottarga and lumpfish roe) or the delicious Cream of seasonal organic vegetables. If you like Antipasti you have many options, including Antipasto Lucano (pezzente della montagna materana (a Slowfood presidium), soppressata and Pecorino di Moliterno, or organic Pecorino di Scanno 'Mbriaco with organic Aleatico gelatin, or an organic Sardinian antipasto with Fiore Sardo (a fresh cheese), pickles, pane caresau (a traditional Sardinian flat bread), and salame. And what can one say of Bruschetta di Castelmagno with the aroma of Porcini? Or you may come on a night dedicated to Slowfood Presidia, the perfect occasion to discover Susaniella Viterbese, Marzolina di Caprai, and Roman Caciofiore. I could continue at length on the Antipasti, but leave the pleasure of discovering the many options to you. With regards to first courses, of late I have much appreciated the home-made spumoni in Anguillara broccoli and salted ricotta, but have also much enjoyed smoky Spaghetti Cacio e Pepe, an alternative to a classic Roman dish, and was also gripped by Speghetti with cured prok jowl from a Cinta Senese and zifft (ground sweet peppers from Lucania). There are seconds worth a journey too, including the delicious No Carbon Footprint tender pork loin with aromatic herb sauce, and if you'd rather not meat, then the superb middleastern organic Capena chickpea pie or stewed organic faro and radicchio seitan with balsamic sauce. Desserts? No problem; one can go to town with the 70% extrta chocolate cake (flourless and with fair trade organic chocolate). Crepes with monterotondo Ricotta and Sardinian Scrub forest honey, or the superb Madagascar Vanilla (a Slowfood presidium) ice cream with hazelnuts in organic honey, or as an alternative aged goats'milk cheese with a compote made of Williams pears from Modena and Passito Torre Quarto. That enough? And to drink? Wine, of course, a careful selection ranging from the Alto Adige to Sicily made with the assistance of her sister Maria Paola, a sommelier, to perfectly accompany the dishes presented. 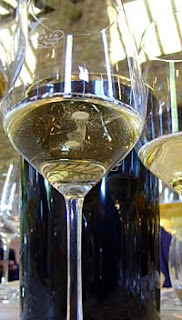 There are also surprises, including Mariotti's excellent Verdicchio dei Castelli di Jesi or Carbone's Fiano from the Vulture, and if you like bubbly there's Carlino, a pinot Grigio brut from the Collezione Giuseppe Trisciuzzi (Veneto); from Campania come the wines of Ciro Picariello and Masseria Venditti, and then there are great reds including Fratelli Cavallotto's Barolo Bricco Boschis and Monte dell'Ora's Amarone della Valpolicella Classico. With dessert one can enjoy Laus di martinez's fortified Malvasia, head to Umbria for Poggio Turri's Sagrantino di Montefalco Passito, or enjoy Di Filippo's Vernaccia di Cannara. Obviously, all this Bounty of God is made even more attractive by Maria Luisa's friendliness and openness; she doesn't hide in the kitchen but rather comes out to chat and discuss things with her guests. That the place is small does have advantages. Prices? Honest; from start to finish will be about 30 Euros, wines not included. The Serego Alighieri estate has belonged to the Serego Alighieri family for hundreds of years -- following Dante's exile from Florence his son Pietro Alighieri bought land in the Valpolicella, and there the family stayed; in the 1500s the last Alighieri married into the Serego family, and that line of the Serego family added Alighieri to their name. In 1973 Count Pieralvise Serego Alighieri reached an agreement with a neighbor, Sandro Boscaini, by which they would make and age their wines (they still have, in a walled vineyard, Molinara vines belonging to the Serego Alighieri clone, on native root stock, while in their cellars they use, in addition to oak, 600 liter cherry casks, following an old Veronese tradition that they are the only ones to continue), while Masi Agricola would take care of bottling and selling the wines, and provided technical assistance as necessary. The goal was to promote quality, which was a revolutionary idea at the time (as was a collaboration between two wineries), and the relationship has worked very well; Serego Alighieri's wines are now renowned and eagerly sought out throughout the world. Pale brassy yellow. The bouquet is quite ripe, with elegant white berry fruit that has some passion fruit and some sweetish accents. It's rather voluptuous, with the Sauvignon evident but not in-your-face. On the palate it's bright, with lively greenish lemony fruit supported by an abundance of savory minerality that provides depth, with some artichoke stem accents that are rather pleasant, and lead into a long clean savory finish with greenish vegetal and sour lemon underpinning. Pleasant, and while it worked well as an aperitif it would also be quite nice with fish. This is a blend of Corvina, Molinara of the Serego Alighieri clone, and Sangiovese. Deep cherry ruby with violet rim. The bouquet is rich, with violets and red berry fruit supported by some alcohol and pleasant sour berry fruit acidity, with some wood, that has cherry accents. Fresh and inviting. On the palate it's bright, with lively cherry fruit supported by lively acidity, with some dusky graphite bitterness and fairly intense minerality that carry into a long, brooding berry fruit finish. The Molinara is pre-phylloxera, planted in 1875 to celebrate the birth of Massimilla's great grandfather Piervalise, while the Sangiovese is for them traditional -- they have been planting it since the 1800s, to round their wines, and it works. Quite well. The first vintage of this was made in 1999 (and released in 2003), to celebrate their 650th anniversary, and Massimilla's Father and Mr. Boscaini chose to make a Valpolicella rather than an Amarone to emphasize the importance of Valpolicella. They made 3000 magnums, and to their surprise it proved quite popular. It's produced using the double fermentation technique, which is essentially what is called Governo Toscano in Tuscany -- partially dried grapes are added to the wine as it sits in the tanks in November, relaunching the fermentation and providing greater depth and richness, and also perking it up. Following fermentation it spent 3-4 months in cherry, and then went into large oak. Deep pigeon blood ruby with violet rim. The bouquet is powerful, and dusky, with rich prune cherry fruit supported by rich berry fruit and shadowy accents, with some underbrush and slight violets as well. Quite elegant, On the palate it's deft, with lively cherry fruit supported by considerable graphite bitterness and very smooth tightly woven tannins, while what acidity there is -- not too much -- is more mineral than fruit derived, and the finish is fairly long, fading into bitterness. It's graceful in a relatively brooding key, and is a wine one can converse with, though it's not a wine I would suggest if you like bright fruit-driven wines. If you instead prefer wines that are more thoughtful you will like it very much. Serego Alighieri Vaio Armaron Amarone della Valpolicella Classico DOC 2005 The Vaio Amaron is a small valley on their property, and Massimilla said, with a sly grin, that they like to think of it as an alternative etymology for Amarone. They accept slight botrytization of the grapes as they dry, because it results in glycerin that softens the wine, without contributing sweetness. Deep black almandine with cherry rim. The bouquet is fairly intense, with alcohol and some sandalwood spice supported by red berry fruit that gradually emerges as the wine opens, supported by alcohol, cocoa, and some brandied berry fruit accents. On the palate it's rich, with powerful jammy cherry fruit supported by some sweetness and tannins that are brooding, with considerable peppery spice and some minerality that flow into a rather peppery finish, which is elegant and fairly long. It's not as rich as a better vintage would be, but quite nice and a beautiful expression of 2005. Serego Alighieri Vaio Armaron Amarone della Valpolicella Classico DOC 1995 I recall this vintage as having been cool and wet in Tuscany -- several periods of rain -- and in the Veneto, Massimilla says, it was "bizarre." Deep brick ruby with cherry rim. The bouquet is intense, with leaf tobacco and savory notes mingled with cedar and camphor, supported by fairly intense sour cherry fruit and some Moroccan leather. Nice depth. On the palate it's fairly rich, with dry cherry fruit supported by smooth tannins that have a degree of cherry dryness and resin to them -- the wine spent longer in cherry wood than it does now -- and flow into a long warm finish. It has a distant feel to it and a fellow taster says it reminds him of a Marsala, and I can understand the impression. Nice, but clearly from a more difficult vintage. Serego Alighieri Casal Dei Ronchi Recioto della Valpolicella Classico DOC 2006 Impenetrable pyrope with cherry rim. The bouquet is fairly intense, with graphite and some bitterness supported by moderate berry fruit -- black cherry and blackberry -- and by some sweetness. On the palate it opens nicely, revealing rich red berry fruit and blackberry fruit with delicate slightly sour prune accents supported by smooth sweet tannins that have a deft graphite shaving overlay and flow into a clean rather bitter finish in which graphite balances sweetness, and there are slight rusty accents. Quite deft, and will drink nicely far from the table or with cheeses. It's a more measured interpretation of Recioto than some, concentrating more on finesse and balance than opulence. Amalia Cascina in Langa is a new (the first vintage in 2007) winery in Monforte, which Marco Sodini -- a fellow Pellegrino Artusiano -- introduced me to, and I have to thank him. The estate, which is centered around a Cascina, or farm house, was bought a few years ago by Luigi Boffa, who restructured the place, building a very functional cellar. His son Paolo makes the wines, under the direction of Gian Franco Cordero and Gian Piero Romana (consulting winemaker and agronomist, respectively), and though the Boffa family is new to winemaking, they are doing something right. Lots of things, actually. Intense pyrope with violet rim. The bouquet is classic Dolcetto with berry fruit supported by bitter almonds and floral accents with some underlying jammy notes. What one expects of a Dolcetto. On the palate it's rich, with powerful slightly sour berry fruit supported by violets and bitter almonds, and tannins that are slightly splintery and flow into a clean fairly long tannic finish with violets and fruit. Quite pleasant, in a rich and friendly cast, and will drink very well with simple grilled meats or light stews, and also hearty pasta dishes. Amalia Barbera D'Alba 2008 Deep black almandine with black reflections and cherry rim. The bouquet is fairly intense, with red berry fruit supported by savory accents and cedar, and by some greenish warmth. On the palate it's bright, with lively sour cherry fruit supported by bright berry fruit acidity and by tannins that have a slight cedar overlay and flow into a clean sour cherry finish. The wood is less apparent on the palate than the nose, though it does contribute nicely to the tannic structure, and the wine is pleasant in a middle of the road key. It will work well with grilled meats or light stews, and will go quickly. Amalia Sogno Langhe Rosso 2008 This is a blend of Cabernet and Barbera; they decided to go with Cabernet because they had the opportunity. 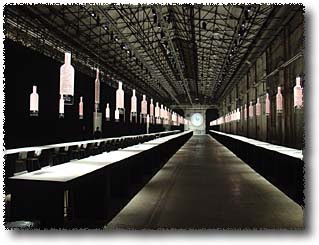 They make about a thousand bottles, and the proportions vary from year to year. This vintage is 90% Cabernet. It's deep pyrope with black reflections and cherry rim. The bouquet is rather varietal, with red berry fruit supported by classic grilled green pepper and by pleasant underlying spice,with while there are also some jammy accents to it. On the palate it's full and rich, with powerful berry fruit, a mix of sour cherry and some forest berry fruit supported by bright sour cherry acidity that is the contribution from Barbera, and supported by very smooth sweet tannins that have a slight greenish overlay and flow into a long warm fruit laced finish. Pleasant, and will drink very well with red meats, from a crown roast through leg of lamb. It will also age nicely for 5 or more years, though the brightness of the acidity at present is quite pleasant. Deep almandine with black reflections and almandine rim. The bouquet is elegant, with rosa canina and red berry fruit supported by deft bramble and hints of sandalwood spice; it's a fine expression of Nebbiolo. On the palate it's bright and rich, with elegant sour cherry fruit laced with raspberries and supported by bright berry fruit acidity, while the tannins are warm and slightly splintery, flowing into a clean rather savory tannic finish with lasting raspberry warmth. Quite pleasant and very fresh, a wine that will work well with read meats and light stews, and will also age nicely for 3-5 years. A pleasant discovery that will drink very fast. Deep almandine with black reflections and almandine rim. The bouquet is fairly intense,with ith quite a bit of cedar and some red berry fruit supported by chemical notes and spice. It's still very closed,a nd really doesn't want to be disturbed. On the palate it's ample, with moderately intense warm sour cherry fruit supported by tannins that are rather angry, with a decidedly peppery burr that continues at length into the finish, settling gradually into lasting warmth. It reflects the vintage, with a green aggressiveness to the tannins, and it needs a number of years for things to fold in. In the wine's defense this was their first vintage, and they were very much getting a feel for things when they made the wines. The bouquet is muted, which can happen in a barrel samle, but reveals berry fruit and slight cedar. On the palate it's another animal with respect to the 2006, with richer cherry fruit and tannins that are much sweeter and softer, and though they do have a youthful burr they aren't aggressive, and don't have any of the angry peppery spice that the 06 displays. Quite promising and will be an elegant Barolo in a few year's time, in a middle of the road key that will be worth looking out for. Want to know more? Their Site. If you drink wine sealed with corks you will sooner or later come across a bottle that is corked. This is not good; ideally the aroma will be of that unpleasantly metallic gassy frizz-your-hair-and-make-your-eyes-water variety, which leads you to refuse the bottle if you're at a restaurant (arguing with the owner if need be) or ask for another bottle if you're at a tasting. Unfortunately, cork taint is not always this obvious. Quite the contrary, it can be subtle, and in its most pernicious form it simply casts a veil over the aromas, making the wine seem drab and uninteresting. In this form it's easy to miss, because there's nothing really obviously wrong -- the wine just seems humdrum, and there's certainly a lot of humdrum wine out there. However, if you do taste a second bottle of the wine, the difference is like the sun emerging from behind a cloud. As you might guess, this latter sort of cork taint -- which I find to affect between 5 and 10% of the wines I taste -- gives winemakers fits. And there are solutions, for example synthetic corks, glass stoppers with silica rings, and screw caps. All of which (screw caps especially) are by now quite common outside of Italy. 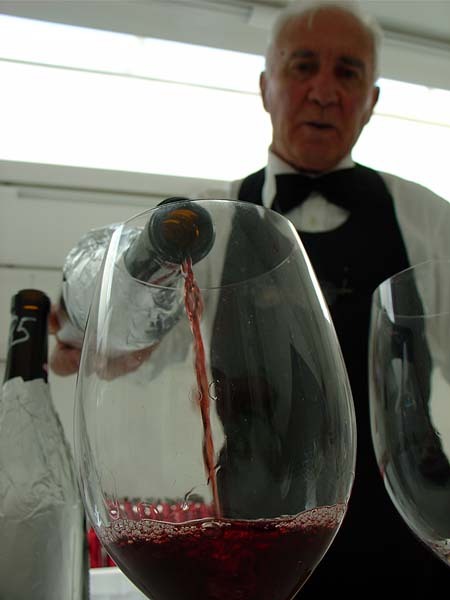 However, in Italy there is still considerable resistance to alternative closures, on the part of the Appellations, which continue to call for cork, and on the part of the restaurant trade, which claims that screw caps and such eliminate the "poetry" inherent in uncorking the bottle and sniffing the cork and so on. How anyone can find a product that ruins 10% of what it seals poetic is beyond me, but they do. However, things are beginning to change, thanks in part to winemakers sick of the damage they suffer from bad corks (price does not guarantee an absence of taint) and thanks in part to importers requesting non-cork closures. In 2009 I tasted Paolo De Marchi's 2007 Chardonnay IGT Toscana, which he bottles with screw caps for those who want them, and corks for those who don't. It was quite interesting: The wines were both very good (90-91 points for both), but also quite different; the screw cap was fresher, while the cork was a little more mature, and I concluded that, "Comparing them side-by-side is like looking at a pair of twins, who might seem identical at first glance, but reveal differences as one gets to know them; the screw cap wine is just a touch crisper and has a slightly harder edge to it, whereas the cork-stoppered wine is a little softer, and comes across as slightly more seductive. Both are very fine, and which you prefer will be a matter of taste. To continue with the twins analogy, one trains competitively -- the screw cap -- while the other -- the cork stopper -- dances." Now Paolo is also bottling Cepparello with a screw cap for foreign markets that request it. 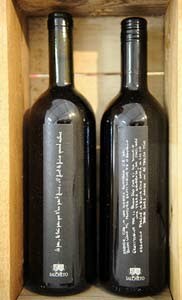 The Azienda Salcheto in Montepulciano is being even bolder: They have taken the radical step of bottling half of the 2005 vintage of their signature wine, Salcheto Evoluzione, which spends four years in bottle prior to release, with screw caps and the other half with corks. 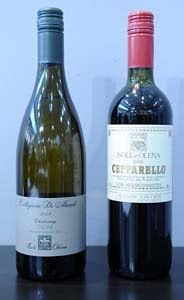 The same wine, with the screw cap bottles classified IGT, and the cork-sealed bottles Vino Nobile di Montepulciano DOCG, sold in boxed sets with one of each kind. As I said, a bold move, because it will oblige the many Italian consumers who greatly enjoy Salcheto Evoluzione to try a top quality wine with a screw cap closure of a kind still viewed with disdain here. Fairly deep almandine ruby with black reflections and almandine rim that has faint hints of ruby to it. Fairly rich berry fruit with slight candied accents and clean bramble with some spice and delicate underbrush. Quite fresh, and displays considerable harmony. On the palate it's rich, deft, and elegant, with rich sour cherry fruit supported by brisk sour berry fruit acidity and slight underbrush, and by tannins that are warm and smooth, and flow into a clean bright tannic finish. Graceful, with beautiful acidity that interplays very well with the tannins, making a wine that is deft and quite light on its toes, rather like a dancer. It will go beautifully with a steak or roast, and will age quite nicely for many more years. Fairly deep almandine ruby that has slightly more garnet to the rim. Moderately rich bouquet with berry fruit supported by warmth and slight balsamic accents with underlying greenish spice; it has a slightly ethereal feel to it and is somewhat more reserved than sample 1, while there are hints of cedar that don't stand out as much in the other. On the palate it's rich, with fairly bright sour cherry fruit supported by bright sour cherry acidity and by tannins that are quite smooth, and display a slight cedary burr that carries into a long fresh bright cherry finish. The tannins are a little smoother here, and display a greater degree of cedar and vanilla than those of sample 1, and this makes the wine a touch more settled than the first. Both are quite elegant, and very pleasant to drink, to the point that one really cannot say that one is better and the other is worse. The first (which is the screw cap bottle) is slightly fresher, and a touch brighter, whereas the second is slightly more mature, and displays the oak to a greater degree. A very interesting comparison, of a sort that would not be possible where screw caps are already commonly accepted. And quite impressive; the screw caps held very well, and were also more consistent -- there was some variation from one cork-stoppered bottle to th e next, whereas the wine in the screw cap bottles was the same. And this brings up the question of what, exactly, the cork stoppered bottles, none of which suffered from cork taint, are getting from their corks. It turns out corks do release tannins into the wine, and also aromas, which Michele Manelli, Salcheto's Director, describes as "earthy and animal." And oxygen (which must be mopped up with a shot of sulfites to keep it from damaging the wine), even if the bottling line fills the neck of the bottle with inert gas. The bottom line is that for wines to be drunk young, alternative closures are definitely a good idea, and given this the Nobile di Montepulciano Consorzio's decision to allow bottling Rosso di Montalcino with screw caps is quite interesting and -- for Italian Appellations -- potentially groundbreaking. For wines to be aged? Corks are potentially more interesting because of what they release, but there are several ifs. What is the quality of the cork, what tannins will it emit, and what aromas? In short, Michele says, corks in the long run are a roll of the dice. They may improve the wine, but they may not, and in this respect are like barriques, which can have more or less positive effects upon the wine they contain. Bottom Line: I will continue to appreciate corks in bottles suitable for long aging, because when they contribute positively they can add wonderful nuances, but will certainly not look askance at a screw cap, even from the most august Appellation. To begin, the picture: Not from Vinitaly, but rather from (if I remember right) Alba Wines. In any case, Pin, a wonderful guy and an excellent sommellier, pouring a covered bottle for us to taste. Returning to Aurelio Settimo, I look forward to seeing Tiziana at Vinitaly every year -- despite the hubub that surrounds her stand, the wines invite concentration and reflection, and strange as it may seem give me an opportunity to (briefly) get away from it all. This year they also offered an opportunity for reflection, because she was pouring not just the most recent (2007) Barolo, but th 2006 as well, and also a couple of older vintages. Long term readers know that I had my doubts about the 2006 vintage when it was released, and though I am not as drastic now, I continue to think that it's a difficult vintage that will require considerable time to emerge. When it does it will be very nice, and therefore unless you absolutely must drink it now, set it aside and (if you like young Barolo) enjoy the 2007 vintage, which is readier. Lively cherry ruby with cherry rim. The bouquet is quite fresh, with considerable sour berry fruit acidity and clean spice with pleasant bitter almonds as well, and some alcohol too. Quite elegant and very fresh. On the palate it's bright, and rather tannic, with rich sour cherry fruit laced with violets nd supported by tannins that have a dusky burr and flow into a clean rather bitter finish. A classic food wine that will work very well with grilled meats or light roasts, and go quite quickly, supporting what it's served with. Elegant almandine with brilliant reflections and garnet rim. The bouquet is elegant, though grudging -- it doesn't want to reveal itself -- with rosa canina and sour berry fruit supported by alcohol and some spice with slight hints of leather and leaf tobacco, and a savory underpinning. On the palate it's elegant, with deft sour cherry fruit supported by hints of roses and savory notes, and by tannins that have an angry peppery burr and flow into a fairly long tannic finish. It's graceful, but still hampered by the tannins, which continue to be rather angry and need more time; this said one could drink it now, and enjoy it considerably, but one would need a succulent cut of meat with some fat to balance the tannins, say leg of lamb or even lamb chops -- including fried lamb chops. I would expect it to age well for close to a decade more. Pale almandine with black reflections and almandine rim paling to an orange nail. The bouquet is quite pleasant, with some rosa canina and pleasant spice, with leather and leaf tobacco and underlying berry fruit that's not too intense; it gives the impression of being from a cooler vintage but is quite graceful. On the palate it's bright, with lively sour cherry fruit supported by sour berry fruit acidity and by tannins that are warm and smooth with some greenish vegetal accents that are again indicative of a cooler vintage, and it flows into a clean bright tannic finish with lasting warmth. Graceful in a lesser vintage key, and very much alive; it will drink well now with grilled meats or hearty roasts, but also has considerable aging potential, nd will become pleasantly ethereal with time. Pale almandine with brilliant reflections and almandine rim. The bouquet is fairly intense, with delicate rosa canina supported by tart berry fruit and some greenish accents with quite a bit of alcohol and some leaf tobacco. It's still quite young, and needs time, but is developing nicely. On the palate it's full, with rich cherry fruit on the outset that is still interrupted by a rush of angry peppery tannins that flow into a warm tannic finish. The tannins are green and rather strident, and the wine needs time to work its way through them, at present it's like a person in a tizzy who REALLY WANTS TO BE LEFT ALONE. If you must drink a bottle now, I would serve it with a succulent, fairly well done leg of lamb or a crown roast, cooked medium rare and sliced thick. But given the choice I would let it sit for at least 5 years, because it has nice potential that has yet to emerge. Elegant almandine with brilliant black reflections and almandine in the rim. The bouquet is elegant, with red berry fruit supported by savory notes and fairly rich berry fruit acidity, while there is also alcohol and there are hints of rosa canina. Very young, but promising. On the palate it's a distinct step up from the 2006, with rich cherry fruit supported by sour berry fruit acidity and by sweet smooth tannins that have a slight vegetal underpinning but are already fairly smooth, and flow into a long clean bright finish with deft tannic underpinning. Very nice, and though woefully young is already drinkable; if you must it would be nice with a steak, but it will richly reward you if you have the patience to give it time. Lively almandine with black reflections and almandine rim. The bouquet is fairly rich, with leaf tobacco and some spice supported by acidity and some berry fruit; there's also some leather and a degree of minerality, while there isn't too much fruit. Cooler vintage. On the palate it's elegant, with moderately intense sour cherry fruit supported by deft sour cherry acidity and smooth sweet tannins that flow into a fairly long clean sour cherry finish with a brambly warm tannic underpinning. It's more graceful than the base, but again clearly from a cooler vintage, and in this context quite graceful and has a great deal to say. Elegant almandine with black reflections and almandine rim. The bouquet is delicate, with ripe berry fruit supported by peppery spice and some leaf tobacco, with hints of Risa Canina too. It's quite elegant but at the outset of a long journey. On the palate it's rich, with elegant sour cherry fruit supported by fairly bright berry fruit acidity and by smooth sweet tannins that do have a slight burr, and flow into a fairly long clean fresh berry fruit finish with savory tannic underpinning. It's quite elegant, but extremely young and needs time to get together; by comparison with the 2007 base it's a bit further behind now but will I think surpass it handily with time. A wine to set aside. Elegant almandine with almandine rim. The bouquet is eye opening, along the lines of a religious experience, with leaf tobacco and spice supporting rosa canina and some smoky noes, with berry fruit as well. It's very young but already beautiful and clearly still coming together. On the palate it's beautiful with rich leathery fruit supported by savory berry fruit acidity and sweet tannins that have slightest hazelnut bitterness and flow into a long warm berry fruit finish; it's quite quick to write, but extraordinarily elegant, and will do beautiful things with time. Most impressive. Tiziana finds the 2007 to have many similarities with the 2000 when it was young, and therefore brought a bottle of it that I found some of in my glass. It's elegant almandine with black reflections and almandine rim, and has a rich bouquet with rosa canina and leaf tobacco supported by berry fruit and brandied cherries, and deft spice; there's rare harmony and rather than pick aromas as they emerge it's a wine that's fun to simply contemplate. On the palate it's rich and elegant, with powerful cherry fruit supported by deft sour berry fruit acidity and by tannins that are smooth and supple, and flow into a clean savory berry fruit finish; it's again quick to write but extremely harmonious, and one of those wines that captures the attention. Most impressive, and if you're lucky enough to have 2 bottles, keep one for a looooong time. 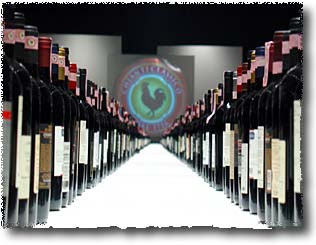 This year the folks at the Chianti Classico Consorzio decided to do something different: Rather than hold two days of sit-down tastings with sommeliers, they held only one, and limited the second day of the vintage presentation to the hall with the booths where the winemakers were pouring their wines. In other words, they tried to get the journalists to interact with the winemakers. As one might expect, the results were mixed; winemakers who enjoy considerable favor were mobbed, while those who are less esteemed or less known had a much more quiet time of it. And there was a segment of the journalists that complained loudly about not being able to taste "seriously" for both days. I confess that I was initially in this camp, primarily because it is very convenient to sit and taste while someone else opens and pours the wines. However, wines are only half of the equation; to fully understand them one also has to know something about where they come from and the people who make them, and while this is easy for me -- since I live in Chianti I can just get into my car and drive to most anyone -- it's much more difficult for those who live far away. Since we were limited to a single day of sit-down tasting, I decided to taste a number of wines from each of the vintages being presented to see what if any conclusions I might draw. After tasting Castello di Ama, which there is invariably a run on, I turned to the older vintages and worked forward. The wines are presented in the order tasted, in mid-Feburary 2011. Castello di Ama Castello di Ama Vigneto Bellavista Chianti Classico DOCG 2007 Deep black cherry ruby with dusky black reflections and cherry rim. The bouquet is powerful and elegant, with rich sour cherry fruit supported by graphite shaving bitterness and dusky berry fruit acidity that brings to mind dappled shade. Great depth and harmony, and though it's quick to write it's a wine you can simply sniff in the glass. On the palate it's medium bodied, with rich cherry fruit supported by fairly brisk sour cherry acidity and graphite-laced bitterness, while the tannins are very smooth and have a slight cedar laced burr, flowing into a clean rather bitter finish. Very pleasant in a deft well polished international key, and a wine that has a great deal to offer now, especially with succulent grilled or roasted meats, though it will also age gracefully for 5-8 and perhaps 10 years. If you like the style you will love it, and even if you are more traditionally minded you will find that it gives you ample food for contemplation and thought. Castello di Ama Vigneto La Casuccia Chianti Classico DOCG 2007 Deep pigeon blood ruby with black cherry rim and black reflections. The bouquet is intense, and quite elegant, with rich sour cherry fruit supported by black currant fruit and deft cedar that integrates without standing out, and also slight hints of underbrush and some graphite shavings too. On the palate it's young, and graceful, with rich cherry fruit supported by deft Sangiovese tannins that have a slight burr, and by dusky bitterness laced with dry underbrush that flows into a clean deft slightly bitter tannic finish. It's tighter than the Bellavista, and also a little further behind, and needs another year to come together, but when it does it will be both willowy and graceful, and an absolute delight to drink; by comparison with the Bellavista it is a little less round. Give it time, because it will reward you. Chianti Classico 2004 Riserva: 2004 was a beautiful vintage, and in verticals almost invariably stands out. Here we have a mixed bag, because wineries that are presenting the older vintages are doing so because they still have some to sell. In some cases because they have given their wines time, and in others because they have simply not sold. Fattoria Di Vegi Fattoria di Vegi - Silvio Chiostri Chianti Classico DOCG Riserva 2004 Deep black almandine with blacj reflections and almandine in the rim. The bouquet is clearly mature, with dried flowers and slight balsam-laced berry fruit that has a dusky cedar component as well. It brings to mind old lace on the back of a chair. On the palate it's a bit tired, with moderately intense cherry fruit that's more balsamic than I might have expected, and supported by tannins that have a dusty balsamic burr, while the acidity is moderately and rather warm, flowing into a decidedly tannic balsamic finish. I'd have liked richer fruit to support it. Il Poggiolino Il Poggiolino La Riserva Chianti Classico DOCG Riserva 2004 Cherry ruby with black cherry rim. The bouquet is graceful, and rather understated, with cherry fruit supported by minerality and some spice; it's harmonious and pleasant to sniff in a graceful key. On the palate it's bright, with tart cherry fruit supported by lively sour cherry acidity and by tannins that have a greenish brambly burr and flow into a rather warm sour cherry finish. Pleasant, in a fairly traditional key, and will drink quite well with succulent grilled meats or hearty roasts, and will also age nicely for another 5-10 years. Chianti Classico 2005 Riserva 2005 was a difficult vintage in Chianti: It was cool, and rained every few days through much of the summer. As a result many wineries had problems with grape ripening, and produced vintage wines with moderate fruit and decidedly brambly tannins. The 2005 Riserva wines presented were a mixed bag; some display a graceful elegance in a decidedly cool vintage key, while others alas do not. Castell'in Villa Chianti Classico DOCG Riserva 2005 Black cherry with black reflections and some almandine in the rim. The bouquet is fairly rich, with balsam-laced berry fruit and some dried flowers mingled with slight dusky cedar and moderate warmth. On the palate it's medium bodied, with bright berry fruit supported by lively sour cherry acidity and tannins that have a bright rather brambly burr and flow into a clean bright berry fruit finish. It's quick on its toes and moves easily, not an ounce of excess fat to it, and if you like the style you will enjoy it very much; it will work very well with grilled meats or roasts, and will also age nicely for another 5-8 years. Castello di Monastero Castello di Monastero Chianti Classico DOCG Riserva 2005 Fairly deep black cherry ruby with black reflections and cherry rim. The bouquet is mature, with mentholated cherry fruit supported by some wet leather and vegetal accents, and some warmth as well. On the palate it's medium bodied, with rather lax red berry fruit supported by tannins more than acidity, and the tannins are fairly dry, leading into a dry tannic finish. It's not a wine to drink by itself, though the tannic burr will make it work quite well with fattier meats that beg something to clear the palate between bites. Castello di Monterinaldi Castello di Monterinaldi Chianti Classico DOCG Riserva 2005 Deep black cherry ruby with black reflections and cherry rim. The bouquet is surprisingly rich for an 05, with jammy cherry fruit that has some peppery accents and a fair amount of spice. On the palate it's full in a decidedly languid key, with round rich cherry fruit supported by fairly bright jammy acidity and by tannins that are very smooth and flow into a clean plum-berry fruit finish. It's rather voluptuous, or would be if it were from a vintage less cool and less wet; it doesn't quite make it but does have a cheeky air about it, and will drink well with succulent frilled meats along the lines of leg of lamb, or with stews, including spicier sweeter stews such as goulash. Il Molino di Grace Il Molino di Grace Il Margone Chianti Classico DOCG Riserva 2005 Deep almandine with black reflections and almandine rim. The bouquet is mature, with fairly rich balsamic cherry fruit supported by some greenish cedar and vegetal accents as well, and a moderate amount of alcohol. On the palate it's full, with rich dusky cherry fruit supported by warm sour cherry acidity and by tannins that have a clean dusky balsamic burr, and flow into lasting balsamic warmth. Quite pleasant and a fine expression of a cooler wetter vintage, with rich acidity that complements and guides without overwhelming, and pleasant cool weather fruit; it will drink very well with stews or roasts, and will hold up for several more years, though I would be tempted to enjoy it now with foods. 2006 was, on paper, a much better year than 2005, or at least it seemed that way at the time. However, since then the vintages have offered considerable opportunity for reflection; the 2006 wines from many of the central and northern Appellations, including those in Tuscany, the Langhe and the Valpolicella have been very slow to mature with decidedly strident tannins. This is true here too; a fellow taster says they are simply "not user friendly" and need time, and I think he may be right, because many do display potential. But simply want to be left alone at present. My impressions of these specific wines? As was the case with 2004, they are a mixed bag, with some that are being presented now because the winemakers chose to keep them longer, and others because they still have them to sell. Castello di Monsanto Castello di Monsanto Il Poggio Chianti Classico DOCG Riserva 2006 Deep black almandine with black reflections and cherry rim. The bouquet is elegant and rather austere, with cherry fruit supported by dusky dried orange peel and some slightly balsamic cedar. On the palate it's bright, with rich savory cherry fruit supported by bright berry fruit acidity and by tannins that are warm and full, and have rich balsamic accents, and flow into a long rich savory berry fruit finish with tannic slightly balsamic underpinning. A beautiful wine of the sort one hates to pour out at a tasting, and that will contribute considerably to a steak or roast, and will also age beautifully for a decade or more. Most impressive. Cantalici Cantalici Messer Ridolfo Chianti Classico DOCG Riserva 2006 Impenetrable pyrope with black cherry rim. The bouquet is moderately intense, with deft cherry fruit supported by some cedar and some greenish accents that gain in intensity with swishing. On the palate it's medium bodied with fairly intense cherry and forest berry fruit supported by tannins that are warm and balsamic, and flow into a warm balsam-laced berry fruit finish. It's a child of the vintage, and though it does display a certain grace comes across as trying too hard. Castello di Cacchiano Castello di Cacchiano Chianti Classico DOCG Riserva 2006 Black almandine with black reflections and almandine rim. The bouquet is moderately intense, with some berry fruit and moderate alcohol, but not much else. It's quiescent. On the palate it's medium bodied, with moderately intense cherry dt supported by dusky balsamic tannins and a fair amount of warmth, which flow into a warm rather balsamic fruit laced finish. It's not as deft nor as tight as I would have liked. Because of its warmth it will work well with succulent grilled meats and stews, but it's not a wine I would be tempted to drink far from the table. Ruffino Ruffino Riserva Ducale - Oro Chianti Classico DOCG Riserva 2006 Deep black almandine with black reflections and cherry rim. The bouquet is fairly intense, with underbrush laced berry fruit supported by balsamic notes and some spice. On the palate it's ample and rather soft, with moderate berry fruit supported by tannins that are ample and rather blocky, flowing into a finish that has peppery spice and some hazelnuts underlain by graphite shavings, while the acidity isn't as marked as it might have been, with the result that the wine is a bit softer -- but not more settled -- than I might have liked. Tenimenti Angelini Tenimenti Angelini - San Leonino - Monsenese Chianti Classico DOCG Riserva 2006 Deep black cherry ruby with black reflections and cherry rim. The bouquet is moderately intense, with cherry plum fruit supported by some sweetness and cherry plum fruit mingled with some blossoms and some cedar. On the palate it's moderately intense, with sour cherry fruit supported by warm berry fruit acidity and tannins that have a warm balsamic cast to them and flow into a warm tannic finish. I'd have liked more richness to the fruit, which feels like it had problems ripening; there's a lack of richness to it that forces the tannins to step in and though they do the effect is not quite the same. Tenuta Villa Trasqua Tenuta Villa Trasqua Chianti Classico DOCG Riserva 2006 Deep pigeon blood ruby with black reflections and cherry rim. The bouquet is moderately intense, with cherry fruit supported by cedar and some alcohol, though not that much, and by some berry fruit. On the palate it's bright, but not tremendously full, with cherry fruit supported by considerable warmth and by tannins that an angry warm burr and flow into a warm rather spicy finish with lasting bitter accents. The fruit doesn't have the ripe fullness I expect of rich vintages; and it is also a bit more sour, as if ripening was interrupted; this said, it is a pleasant wine in this key, and if you like the style, which is rather aggressive, it will drink well with succulent red meats that beg a sip to clear the palate between bites, for example leg of lamb. It's not a wine to sip by the glass, however, and if you prefer smoother more richly fruit driven interpretations of Chianti it won't work for you. Vignole Vignole Chianti Classico DOCG Riserva 2006 Deep black cherry ruby with black reflections. The bouquet is closed; swishing brings up shellac and some minerality but not much in the way of fruit. On the palate it's medium bodied, with dusky moderately intense berry fruit supported by tannins that have strong graphite shaving bitterness to them and flow into a decidedly bitter finish. It's heavily oaked, and the oak carries it, especially in the structure, where the direction comes more from bitterness than acidity. Villa del Cigliano Villa del Cigliano Villa Cigliano Chianti Classico DOCG Riserva 2006 Almandine with black reflections and almandine rim. The bouquet is brambly with greenish accents, spice, and some alcohol, but not much fruit. On the palate it's a bit richer than I expected, with dusky berry fruit supported by moderately intense acidity and by tannins that have warm balsamic accents and flow into a rather tart finish. It's more interesting on the palate than the nose, though I would have liked more richness to the fruit, which is slightly retiring. Cantalici Cantalici Chianti Classico DOCG 2006 Deep black almandine with black reflections and cherry rim. The bouquet is fairly rich, with leathery accents and some bitterness mingled with leaf tobacco and some spice. On the palate it's medium bodied, with fairly rich cherry fruit supported by both berry fruit acidity that has a greenish cast to it, and by tannins that are warm and smooth, and flow into a clean greenish tannic finish with some underlying berry fruit. Pleasant in a fairly rich rather mature key, and tries less hard than the 2006 Riserva (see above), which makes it -- for me -- more interesting because it's working with what it has rather than trying to be more. In terms of accompaniments, grilled meats or roasts. Il Barlettaio Il Barlettaio Chianti Classico DOCG 2006 Deep black cherry ruby with black reflections and cherry rim. The bouquet is muted, though swishing brings up some shellac and slight alcohol but not much fruit. On the palate it's richer than I expected from the palate, with moderately intense sour cherry fruit supported by dusky, smoky tannins that flow into a clean rather spicy tannic finish with lasting warmth. The fruit has to a degree been dried out by the wood, which is carrying the show to a greater degree than it would in a different vintage. Because of the tannic dryness it is best suited to fattier foods that need a sip to clear the palate between bites. 2007 When it first came out the 2007 vintage seemed more nervous than the 2006, with higher acidities and more brambly accents. However, with time it has matured faster, with the tannins smoothing considerably more than those of the 2006 vintage have to date, while the lively acidities of (most of) the wines keep them on their toes and their fruit bright. Consequently as a general rule the wines of the 2007 vintage, both Riserve and Vini D'Annata, are more approachable and readier than those of the 2006 at present. Caparsa Caparsa Caparsino Chianti Classico DOCG Riserva 2007 Deep black cherry ruby with black reflections. The bouquet is fairly rich, with cherry fruit supported by some warm balsamic accents and deft cedar that gain depth from some berry fruit acidity. On the palate it's fairly rich, with cherry fruit supported by warmth and rather greenish cedar laced tannins that flow into a warm tannic finish with sour underpinning that goes on at length. It's not a wine that will drink well far from the table now --it needs a year for the tannins to think about folding in -- but it will drink well with succulent grilled or roasted meats, especially fattier cuts than need something to clear the palate between bites. If you prefer smoother rounder driven wines it won't work for you. Caparsa Doccio a Matteo Chianti Classico DOCG Riserva 2007 Deep black cherry ruby with black reflections and cherry rim. The bouquet is fairly spicy, with greenish accents and some alcohol, but not much fruit, and it gives an impression of not wanting to be disturbed. On the palate it's ample and rather soft, with dusky cherry fruit supported by moderate acidity and by tannins that are warm and dusty, and flow into a warm berry fruit finish It's a touch drier than I'd have liked, but because of its dryness will work well with grilled meats. I would give it time, because I don't think it's quite ready yet, and a score now is premature. Castello di Querceto Castello di Querceto Chianti Classico DOCG Riserva 2007 Impenetrable pigeon blood ruby with some almandine in the rim. The bouquet is moderately intense, with cherry fruit and deft underlying cedar mingled with minerality and spice. On the palate it's still coming together; the palate opens with fairly bright cherry fruit supported by moderately intense berry fruit acidity and tannins that are rather dry, and flow into a clean tannic finish. It needs another couple of years to come together, and is a bit drier than I had expected; the tannins are carrying to a degree for the fruit, and this means the wine will drink with more succulent meats, and isn't a wine I would drink by the glass. Castello di Verrazzano Castello di Verrazzano Chianti Classico DOCG Riserva 2007 Deep black cherry ruby with black reflections and cherry rim. The bouquet is brambly, with fairly rich berry fruit supported by lively acidity and some brambly greenish vegetal accents that are rather lively. On the palate it's bright, with rich cherry fruit supported by lively berry fruit acidity and tannins that have a greenish vegetal underlay and a marked youthful burr, and flow into a fairly bright sour cherry finish. Pleasant in a lithe key, with considerable grace, and will drink well with grilled meats or light stews now, and also age well for a decade or more. Concadoro Concadoro Chianti Classico DOCG Riserva 2007 Deep black cherry ruby with black reflections and cherry rim. The bouquet is moderately intense, with cherry and plum fruit supported by some greenish accents and some lacquer that may be wood-fruit interaction. On the palate it's medium bodied, with rather dusky cherry plum fruit supported more by minerality than by acidity, and by ample smooth tannins that have slight hints of graphite bitterness to them, and flow into a rather bitter finish with some peppery brandied cherry plum accents. It needs a year for the nose to really come together, and is a wine that won't work as well for you if you prefer wines that are more aggressive and acidic. Fattoria Nittardi Fattoria Nittardi Chianti Classico DOCG Riserva 2007 Almost impenetrable pyrope with black cherry rim. The bouquet is powerful, and powerfully oaked, with intense cedar mingled with slight balsamic warmth and some fairly bright acidity that has a certain cheekiness to it. On the palate it's similar, with ripe fairly sweet plum cherry fruit supported by moderate acidity, and by tannins that are strongly cedar laced and flow into a long warm fairly sweet (almost brown sugary) plum finish with strong cedar underpinning. It's extremely ripe, and extremely oaked, and as such is something of a throwback ì, bringing to mind the push to ripeness and concentration that was more popular a few years ago. It's particular, and you should only consider it if you like the style. If you prefer tighter wines with more red fruit, or brighter acidities it won't work as well for you. Fontodi Fontodi Vigna del Sorbo Chianti Classico DOCG Riserva 2007 Deep black cherry with black reflections and cherry rim. The bouquet is muted at first swish, though more swishing brings up graphite shavings and some alcohol mingled with spice and bitterness, and slight fruit. It's still coming together. On the palate it's fairly rich, with warm sour cherry fruit supported by peppery spice and moderately intense red berry fruit; it again gives an impression of coming together but is a little further along, and is supported by tannins that display a lively peppery burr at least in part from oak that needs at least a year to fold in. I would give it the time, because it will be elegant in a fairly modern key, and to be frank it's not ready now. Castello di Querceto Castello di Querceto Il Picchio Chianti Classico DOCG Riserva 2007 Lively black cherry ruby with black reflections and cherry rim. The bouquet is fairly intense, in a traditional key, with some wet stable straw mingled with savory accents and some greenish vegetal accents. On the palate it's lighter than I had expected, with sour plum cherry fruit supported by brambly acidity hat is also fairly bitter, and by tannins that are again bitter, with a fair volume of graphite shavings, and flow into a rather dusky finish. It's a rather mineral wine, without much brightness of fruit, and also has a brooding quality to it; if you like the style you will enjoy it, but you have to like the style. It will, with time, become ethereal and rather lacy, though I don't think it will be too long lived. Ormanni Ormanni Borro del Diavolo Chianti Classico DOCG Riserva 2007 Black almandine with black reflections and almandine rim. The bouquet is muted, though swishing brings up greenish berry fruit supported by some red berry fruit and some cedar, and by moderate acidity that has some sour orange peel accents. On the palate it's fairly rich, with brandied cherries supported by considerable brandied berry fruit acidity and by tannins that have a warm peppery burr and flow into a dusky berry fruit finish with some plum sweetness and a peppery tannic underpinning. It's a bit dry, due to the tannins, and as a result will drink best with hearty red meats that are also fairly fatty, along the lines of leg of lamb or veal shanks. Poggerino Poggerino Bugialla Chianti Classico DOCG Riserva 2007 Deep black cherry ruby with black reflections and cherry rim. The bouquet is moderately intense, with a fair amount of alcohol and nose tingling acidity, but not much in the way of fruit. It's still developing. On the palate it's brighter than I expected, though with considerable alcohol, and moderately intense brandied cherries and plums supported by brambly bitterness more than acidity, and by tannins that are fairly splintery, with graphite shaving bitterness in abundance, and flow into an angry tannic finish. It's disjointed, with alcohol going in one direction and tannins in another, and I don't know what will happen in the future, but it's not happy now. It's too young to score. Riecine Riecine Chianti Classico DOCG Riserva 2007 Lively black cherry ruby with black reflections and cherry rim. The bouquet is fairly intense, with cedar laced red berry fruit supported by brandied plum accents and some vegetal notes. Pleasant in a charged key. On the palate it's full, and rich, with powerful ripe plum cherry fruit supported by moderate acidity and by smooth sweet tannins that have a slight cedar underlay to them. It's quite ripe, and quite charged, and if you like the style you will enjoy it, though you should give the tannins a year to smooth over. If you prefer the more traditional, scrappier more acidic style of Chianti it won't work as well for you. San Felice San Felice il Grigio Chianti Classico DOCG Riserva 2007 Deep black cherry ruby with black reflections and cherry rim. The bouquet is fairly intense, and a bit unusual, with zucca gialla, the Italian winter squash that resembles butternut squash, and some alcohol too, together with nose tingling pepper spice. On the palate it's medium bodied, with fairly rich cherry fruit supported by brighter than expected sour cherry acidity, and by smooth sweet tannins that flow into a clean fairly long slightly greenish tannic finish with lasting warmth. It's still developing, especially on the nose, but has a degree of zestiness to it that I rather enjoyed, and it will drink well with grilled red meats or hearty stews. I would give it a year or two, and expect it to age well for up to a decade. Villa di Geggiano Villa di Geggiano Chianti Classico DOCG Riserva 2007 Deep black cherry ruby with black reflections and cherry rim. The bouquet is powerful, with rich slightly brandied cherry plum fruit supported by alcohol and an opulent sweetness that is in part the alcohol; it's quite harmonious and pleasant to sniff. On the palate it's ample, with rich sour cherry fruit supported by bright berry fruit acidity and by tannins that have a deft peppery burr and glow into a clean bright sour cherry finish. Graceful, and quite elegant in a traditional key; if you like the style you will enjoy it very much, and even if you generally prefer wines that are rounder and lusher you will find things to ponder here. Expect it to age well for 8-10 years. Castello di Radda Castello di Radda Chianti Classico DOCG Riserva 2007 Black almandine that's paler than some, with black reflections and cherry rim. The bouquet is moderately intense, with greenish vegetal accents and a fair amount of spice, and as it opens some red berry fruit and some musty aromas of wet paper. It's still coming together, but not as clean as it might be. On the palate it's fairly bright, with lively cherry fruit supported by sour berry fruit acidity and moderately intense tannins that are warm and spicy, and flow into a warm spicy sour cherry finish. It's disjointed now and I would give the nose a year to develop and come together, before drinking it with succulent roasted or grilled meats. If the nose cleans up it will be nice, but it needs time. Castello di Volpaia Castello di Volpaia Coltassala Chianti Classico DOCG Riserva 2007 Deep black almandine with black reflections and almandine rim. The bouquet is unusual, with an odd softness and spicy notes mingled with hints of very ripe berry fruit, blackberry and also some cedar. On the palate it's ample and soft, with moderately intense plum cherry fruit supported by moderate acidity and by tannins that are warm and rather splintery, and flow into a rather splintery finish. It's quite ripe, but the fruit isn't really up to matching the tannic structure, which overshadows it, especially in the finish. In its defense it is woefully young, and the tannins will fold in some with time, but I wonder if they will ever fold in enough. Fattoria di Vegi Fattoria di Vegi - Francesco Chiostri Chianti Classico DOCG 2007 Black almandine with black reflections and almandine rim paling to orange. The bouquet is moderately intense, with red berry fruit supported by some leather and spice, but it's still coming together. On the palate it's pleasant, with rich slightly sour cherry fruit supported by deft sour cherry acidity and smooth sweet tannins that do have a slight Sangiovese burr, and flow into a clean fresh sour cherry finish. Quite pleasant in a relatively unaggressive traditional style, and will drink very well with grilled or roasted meats, including fattier cuts such as leg of lamb, or grilled lamb chops. If you like the more traditional style you will enjoy it. Castello di Cacchiano Castello di Cacchiano Chianti Classico DOCG 2007 Deep pigeon blood ruby with black reflections and cherry rim. The bouquet is powerful, with rather pungent plum cherry fruit supported by greenish notes and hints of oatmeal sweetness, which are a bit unusual in a red but work well, and clean spice. Deft. On the palate it's full, with rich cherry plum fruit supported by bright slightly vegetal acidity and tannins that have a warm peppery spicy burr, and flow into a warm spicy berry fruit finish with some jammy overtones. It's quite fresh, and very much alive, but at present the peppery notes of the tannins overshadow the fruit, and because of them it will work better with foods -- succulent red meats -- than by the glass. With time it will smooth, gaining in elegance, though I suspect the tannins will always have a peppery cast to them. Rocca di Montegrossi Rocca di Montegrossi Vigneto San Marcellino Chianti Classico DOCG 2007 Lively black cherry ruby with black reflections and cherry rim. The bouquet is quite young, with cherry fruit supported by deft cedar, but it needs another year to really emerge from its shell. On the palate it's quite elegant but again young, with rich cherry fruit supported by mineral acidity with some berry fruit accents and by tannins that are at present rather splintery, especially in the finish, which comes across as thinner than it will be when they have begun to fold in, in a year's time or perhaps a little more. In short, a work in progress, and though one could drink it now with a steak or roast, it will reward those who give it 3-5 years by improving considerably. A wine worth looking out for the future. Fietri Fietri Chianti Classico DOCG 2007 Lively black almandine with black reflections and almandine rim. The bouquet is powerful, and quite fresh, surprisingly so for a Riserva, with jammy prune and red berry fruit supported by candied accents and hints of cola; one has an impression of extreme ripeness. The palate reflects the nose; it has rich very ripe plum cherry fruit supported by moderate acidity that's brighter than I expected, and by tannins that have a peppery burr and flow into a ripe berry fruit finish with peppery underpinning. If you like the style you will enjoy it, but you have to like big ripe, not overly soft wines. If you prefer a fruit cast more towards cherry it won't work as well for you. Il Molino di Grace Il Molino di Grace Chianti Classico DOCG 2007 Deep black almandine with black reflections and almandine in the rim. The bouquet is quite young, with balsamic berry fruit supported by delicate sour berry fruit acidity and as it opens greenish spice that's fairly pungent. On the palate it's fairly bright, with sour cherry fruit supported by lively cherry acidity and tannins that are warm and savory, and have a slight burr. There's something sassy to it, and it will drink nicely with succulent red meats when it has its bearings, in about a year's time. It grew upon me. Felsina Felsina Rancia Chianti Classico DOCG Riserva 2007 Deep black cherry ruby with black reflections and cherry rim. The bouquet is quite ripe, with rich plum-cherry fruit supported by chalky notes and a sweetness that brings blueberry yogurt to mind, and by spice and a fair amount of alcohol. On the palate it's not as ripe as the nose suggested; it has moderately sour cherry fruit supported by greenish berry fruit acidity with some vegetal accents, and is supported by tannins that still display a cedar veneer and flow into a clean bright sour cherry finish. The nose needs time and the palate too; it's very much in mid stride, and if you give it a year or two I think it could rather richly reward you. At present it's really not ready yet. La Porta di Vertine La Porta di Vertine Chianti Classico DOCG Riserva 2007 Deep black almandine with black reflections and cherry rim. The bouquet is moderately intense and young, with cherry plum fruit supported by a fair amount of alcohol and some but not too much peppery spice. On the palate it's ample and fairly ripe, with prune cherry fruit supported by moderate slightly vegetal prune minerality, and by tannins that have a warm burr and flow into a decidedly tannic finish. 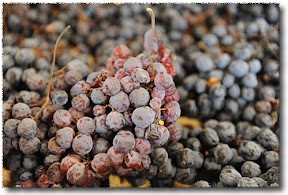 It needs another year for the tannins to fold in, and then will drink well with succulent roasts, including, because of its fruit cast -- the tannins will smooth -- drier meats. Torraccia di Presura Torraccia di Presura Il Tarocco Chianti Classico DOCG Riserva 2007 Deep black cherry ruby with black reflections and cherry rim. Quite dark. The bouquet is moderately intense, with a fair amount of cedar mingled with some graphite shavings and some bitterness. On the palate it's moderately intense, with moderate minerality more than fruit supported by tannic bitterness that has some cedary overtones. There's not as much fruit as I had hoped for. Villa Calcinaia Villa Calcinaia Vigna Bastignano Chianti Classico DOCG Riserva 2007 Lively almandine ruby that's lighter than many, with black reflections and cherry rim. The bouquet is bright, with sour cherry fruit supported by chalky accents and some scalded milk which is likely due to the yeasts. On the palate it's bright, with lively sour cherry fruit supported by sour cherry acidity that again has slightly milky accents, and is supported by tannins that are warm and have a slight burr, and flow into a warm sour cherry fruit finish. If you like the style you will enjoy it, but you have to like fairly aggressive wines. 2008 I said last year that the 2008 vintage was quite variable, with some particularly graceful wines from areas at higher elevations, while those in more low-lying areas suffered the summer heat to a greater degree. This impression holds for the wines I tasted this year too. Castello di Volpaia Castello di Volpaia Volpaia Chianti Classico DOCG 2008 Lively black cherry ruby with black reflections and cherry rim. The bouquet is bright, with fairly rich greenish berry fruit supported by clean bright berry fruit and also fairly intense minerality. On the palate it's light, and fresh, and fairly rich with lively sour cherry fruit supported by smooth berry fruit acidity and by smooth slightly greenish tannins that flow into a clean bright berry fruit finish that gains depth from deft greenish overtones. Quite pleasant, in a sunny sort of way, and will drink nicely with hearty pasta dishes or lighter grilled meats. Castello di Vicchiomaggio Castello di Vicchiomaggio Agostino Petri Chianti Classico DOCG Riserva 2008 Lively black cherry ruby with almandine in the rim. The bouquet is fairly rich, with cherry fruit supported by brambles and a fair amount of alcohol, and by sour cherry fruit that is rather muted at the outset but gradually emerges. On the palate it's bright, with lively cherry fruit supported by deft sour cherry acidity and tannins that have a lively greenish burr and flow into a bright sour cherry finish. Quite pleasant in a rather scrappy key, and will drink nicely with grilled meats or roasts, and also has the acidity necessary fro such delights as fried lamb chops. Villa di Geggiano Villa di Geggiano Chianti Classico DOCG 2008 Lively cherry ruby with black reflections and cherry rim. The bouquet is fairly rich, with sour cherry fruit supported by some vegetal accents and deft spice; it's still coming together but promises quite nicely. On the palate it's bright, with lively sour cherry fruit supported by bright berry fruit acidity and by smooth sweet tannins that flow into a bright berry fruit finish. Classic old style good Chianti, a light fruity wine that will complement what it's served with, and is blessed with quite enough acidity to make it light on its toes, but not so much as to make is squeal. If you like the style you will very much enjoy it. Barone Ricasoli Barone Ricasoli Castello di Brolio Chianti Classico DOCG 2008 Deep black cherry ruby with violet rim. The bouquet is fairly intense, with cherry fruit supported by some cedar and moderate brambly accents and some graphite shavings. On the palate it's ample and smooth, with fairly rich cherry fruit supported by bright but not overly so berry fruit acidity and by smooth sweet tannins that flow into a clean sour cherry finish. Pleasant, in a very approachable key, and though it's not as complex as some Chianti Classico it will drink well with a variety of foods, and not steal the limelight, which is what people very often want. Expect the bottle to go quickly. Mannucci Droandi Mannucci Droandi Ceppeto Chianti Classico DOCG 2008 Impenetrable pyrope with black reflections and cherry rim. The bouquet is quite ripe, with plum cherry fruit supported by jammy sweetness and some greenish heathery notes. It gives an impression of lushness. On the palate it's ample and soft, with rich plum cherry fruit supported by moderate acidity and tannins that are smooth and soft, and flow into a fairly soft finish. It's rather opulent, and if you enjoy the style you will enjoy it. But you have to like the style. Ormanni Ormanni Chianti Classico DOCG 2008 Elegant almandine with black reflections and almandine rim. The bouquet is muted at first swish, though with more swishing sour cherry fruit supported by some bright greenish accents emerges. Quite young, but interesting to sniff and harmonious. On the palate it's medium bodied, with rich slightly sour cherry fruit supported by deft berry fruit acidity and by smooth sweet tannins that flow into a clean fresh sour cherry finish with a pleasant tannic underpinning. It's quite pleasant in a deft rather lithe key, and brings to mind a dancer who moves lightly and easily on her feet. It will be nice with rich pasta dishes, legume based dishes such as fagioli all'uccelleto, and will also drink well with simple grilled meats. Worth seeking out. Poggerino Poggerino Chianti Classico DOCG 2008 Deep black cherry ruby with black reflections. The bouquet is moderately intense, with dusty cherry fruit supported by some bitter accents and slight savory notes, with some graphite shavings too. On the palate it's fairly light, with soft red berry fruit supported by moderate acidity and by smooth sweet tannins that flow into a clean fairly bright sour cherry finish. It's graceful in a lighter fairly direct key, and will drink nicely with meaty pasta sauces or risotti, simple grilled meats, and light stews. A classic every day wine that people will set out and drink. Riecine Riecine Chianti Classico DOCG 2008 Lively black cherry ruby with brilliant black reflections and rim paling to garnet. The bouquet is muted, though swishing brings up sour cherry fruit supported by some jammy accents and by brambly spice, with hints of scalded milk as well. On the palate it's medium bodied and quite ripe, with languid ripe almost jammy cherry fruit supported by moderate acidity and by smooth sweet tannins that flow into a smooth fairly soft finish. Pleasant, in a smoother softer key, and it's a wine you'll like if you like more opulent fruit driven wines. If you prefer brasher more aggressive old-style Chianti, it won't work as well for you. San Felice San Felice Chianti Classico DOCG 2008 Lively black almandine ruby with black reflections and some almandine in the rim. The bouquet is powerful and a bit rustic, with wet stable straw mingled with balsamic accents and some Italian winter squash; there's also a fair amount of acidity, and it's quite traditional in feel. On the palate it's medium bodied, with bright sour cherry fruit supported by lively greenish berry fruit acidity and by tannins that have a slightly bitter cast and are fairly smooth, flowing into a clean fresh sour cherry finish with tannic underpinning. If you like the style, which is quite traditional, you will enjoy it very much. If you instead prefer smoother rounder wines with riper fruit it simply won't work for you. In short, a wine for some but not for all. In any case, it will be quite versatile, working with meat based pasta dishes, legume based soups and dishes, and simple grilled meats. It will also age nicely for 3-5 years. Tenuta di Lilliano Tenuta di Lilliano Chianti Classico DOCG 2008 Lively cherry ruby with black reflections and cherry rim. The bouquet is bright, with greenish accents and sour berry fruit supported by berry fruit acidity and some spice; it's quite young. On the palate it's bright, with lively sour cherry fruit supported by deft berry fruit acidity that gives nice direction, and by smooth sweet tannins that flow into a clean fairly bright berry fruit finish with greenish tannic underpinning. It's pleasant in a traditional key, but not so far into the traditional spectrum (nothing balsamic about it) that those who are of a more modern persuasion won't enjoy it, and it's also quite versatile, and will work well with a variety of dishes, from meat based pasta sauces and other red sauces through risotti and simple grilled meats, while there is enough acidity that it will also be a nice bet with fried meats and vegetables, and also be nice at a cookout. In short, versatile. Castello di Radda Castello di Radda Chianti Classico DOCG 2008 Lively black almandine with black reflections and almandine rim. The bouquet is muted at first swish, though more swishing brings up cherry fruit with some red berry fruit accents and slight greenish notes supported by slight hints of shellac that likely derive from wood; it's still very young and obviously coming together. On the palate it's lively, with bright sour cherry fruit supported by bright berry fruit acidity and by tannins that have a warm greenish burr and flow into a clean fairly rich berry fruit finish with spicy tannic underpinning. The palate is almost as young as the nose, but does display a certain grace, and if you like the style, which is traditional, with scrappy tomboyish acidity, you will enjoy it. Do give it at least a year however to get its bearings and come together, because it (and you) will profit form more time.